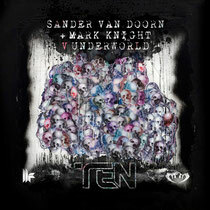 After a decade of releases, worldwide tours, hits from international artists, industry awards and possibly millions of downloads, Toolroom Records mark their 10-year milestone as a label with a driving release from Sander van Doorn, Mark Knight and Underworld, entitled ‘Ten’. Combining three musical minds with enviable production pedigrees could only ever result in a big release, especially considering the individual heritage of each contributing artist. Delivering a vocal performance akin to No.1 smash ‘Downpipe’, (one of our all time favourite tunes! ), Underworld look once again poised to define a generation of Toolroom fans thanks to Karl Hyde’s signature lyricism echoing out across an electronic landscape. Making his debut on the label, Sander van Doorn lends his trademark energised sound to the Toolroom Records catalogue. Mark Knight completes the trio of heavyweight producers, offering his label expertise to complete the energetic workout of techno grooves and classic club riff that make the track. Featuring original artwork from MM (Maxim from legendary British dance act The Prodigy), ‘Ten’ is out March 4. Well done Toolroom Records, it’s been 10 years filled with some tremendous musical memories and we can’t wait for the next 10!